The specified file public://inline-images/https_%2F%2Fs3-us-west-2.amazonaws (15)_0.jpg could not be moved/copied because no file by that name exists. Please check that you supplied the correct filename. 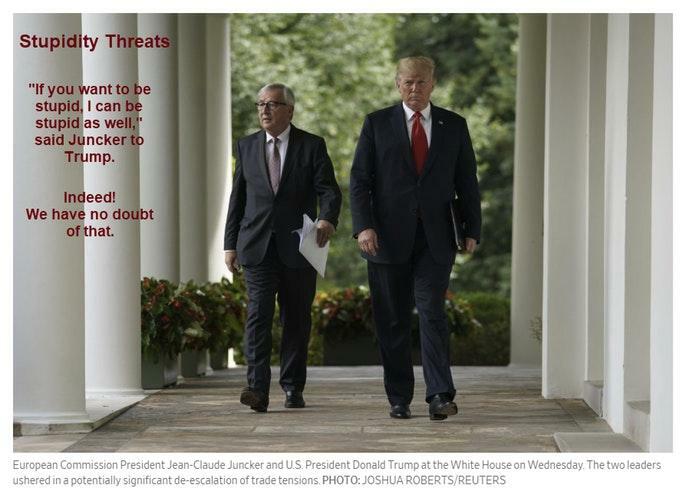 Some amusing details have emerged from this week's alleged trade cease-fire "deal" between Juncker and Trump. Please consider Juncker’s Trade Pitch to Trump: ‘I Can Be Stupid, as Well’. Once Mr. Juncker entered the Oval Office, it was clear Mr. Trump was in a mood to negotiate, said a senior European Union official who was present. Mr. Juncker grabbed the opportunity to argue that both sides need to refrain from further punitive tariffs or they would foolishly harm themselves. Backing up his points, Mr. Juncker flipped through more than a dozen colorful cue cards with simplified explainers, the senior EU official said. Each card had at most three figures about a specific topic, such as trade in cars or standards for medical devices. In a nutshell, Trump backed down. My assessment yesterday was accurate: Trump was feeling the heat from Republican senators and all automakers. For details, please see Trump and Juncker Supposedly Agree to Trade Deal: Lies All Around. My lead-in: "Color me skeptical as to how long this lasts and what happens next." Middle quote 1: "It will take the EU and the US a decade to work out a real agreement. Juncker by himself cannot promise anything. All 27 nations in the EU have to ratify trade deals." Middle quote 2: "So, is Juncker lying today or was he lying two days ago? The US is not going to supply the EU with LNG. That is a direct and blatant lie by Trump. The EU will get natural gas from Russia via Nordstream2. US LNG would be far more costly. So there are lies all around." My conclusion: "With 35 companies and organizations bitching about Trump's inane tariffs, this is best viewed as either a reversal by Trump or a political stunt that accomplishes nothing. Obvious lies aside, it is a good thing to deescalate trade war talk." Eurointelligence commented early this morning echoing what I stated yesterday. We are not sure that the EU can deliver what Juncker promised, and a different interpretation of what was agreed emerged almost immediately. One of the reasons for Trump’s apparent U-turn may have been yesterday’s profit warnings from US car makers due to tariffs on steel and aluminium. Die Welt asks why cars are excluded from this agreement, especially given Trump’s obsession with them. The answer is that it is politically easier for both sides to agree to drop tariffs on general industrial goods than on cars. It is quite possible that the US and the EU might end up with a broad package of measures to liberalise trade, as well as higher US tariffs on imported cars. Before the meeting, the Washington Post quoted sources close to Trump as saying that the president was ready to impose a 25% tariff on all car imports - about $200bn worth. This issue is clearly not off the table. We agree with the conclusion of the article - that it is too early to be relaxed about US/EU trade relations, but the agreement yesterday should nevertheless be regarded as an encouraging sign. We need to watch out for reactions from France in particular. The Germans naturally welcomed it. We are not sure the French will be happy. And finally, we are in full agreement with Adam Tooze, who makes the point in an article in the New York Times that the EU is not right about trade just because Trump is wrong. They are both wrong. He sees the real issue as Europe’s obsession with competitiveness. Sadly, this is what's become of trade negotiation policy: Anything you can do, I can do stupider. I can do anything stupider than you.